Everyone in the kitchen knows the dangers of cutting onions and jalapenos: accidentally getting their potent juices in your eye, on your face, or in your nose! I have extremely sensitive skin when it comes to peppers. Last night, I made three bean chili.. black beans, pinto beans, and garbanzo beans, with quinoa, stewed tomatoes, green peppers, jalapenos, and onions. Here is a similar recipe for Red Beans and Rice. Anyways, while the chili was simmering, I went to the bathroom to wash up because I had just been running. I’m washing my face and all of the sudden it hits me! Piercing heat in my right eye, going down the side of my nose to my nostril. Ouch! It seems that some of the jalapeno juices were still on my hands, despite washing them after cutting the japs. 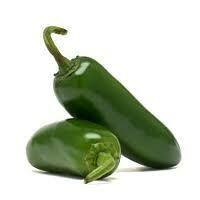 Here is the simplest, easiest way to counteract the heat of jalapenos or peppers on your skin or in your eyes. Use coconut oil as a relief agent! I’m not kidding either. Apply to the corners of your eyes, directly to your skin, and in and around your nostrils. The coconut oil moisturizes the area and eliminates the burning sensation immediately. It won’t leave your skin greasy or be noticeable by others. This trick of applying coconut oil to skin inflammations has saved me numerous times when my skin is on fire. Try it the next time you find yourself at the mercy of jalapeno juice! I’m definitely getting some coconut oil after reading this. Thanks for the info!